Apple unveiled new Mac Pro updates today featuring Intel Xeon E5 processors. The easy-access interior of the Mac Pro feels like the well-organized workstation it is. No rat’s nest of components here. You don’t need to turn the system on its side or struggle to reach into awkward spaces to make changes. Just remove the side panel for instant access to everything. Slide out the processor tray to add memory. Slide out drive bays to add storage. Slide a simple bar to change up to four expansion cards at once. And with plenty of I/O ports both front and back, you’ll have room for all your external devices. The Mac Pro offers two advanced processor options from Intel. The Quad-Core Intel Xeon processor is available in a single-processor, quad-core configuration at 3.2GHz. For even greater speed and power, choose a 6-Core Intel Xeon processor. Since the Mac Pro comes with either one or two processors, you can have a 6-core Mac Pro at up to 3.33GHz, or, to max out your performance, a 12-core system at up to 3.06GHz. System memory is often connected to a processor through a separate I/O controller. But Intel Xeon processors feature an integrated memory controller. By connecting memory directly to the processor, the Mac Pro processors have faster access to data stored in memory, and memory latency is reduced. The integrated memory controller, along with fast DDR3 ECC SDRAM at either 1066MHz or 1333MHz, gives the Mac Pro an increase in memory bandwidth over previous generations. More bandwidth allows for more data to be fed to the processor faster, helping each core spend its time processing data, not waiting for information to arrive. And Error Correction Code (ECC) corrects single-bit errors and detects multiple-bit errors automatically. That’s especially important in mission-critical and compute-intensive environments. The Intel Xeon processors support Hyper-Threading, which allows two threads to run simultaneously on each core. So, for example, a 12-core Mac Pro presents 24 virtual cores that are recognized by OS X. Performance is enhanced because Hyper-Threading enables the processor to take better advantage of the execution resources available in each core. All models are in stock at the Apple Store and available for ordering today. More info about Apple’s new Mac Pro models here. MacDailyNews Take: This is either an interim update to get Apple to a new model or the last Mac Pro update. I’m astonished at the lack of thunderbolt, though 4 FW-800 ports are very welcome. Theoretically, Thunderbolt could be implemented as card for a slot, as it is already done for some Asus motherboards. No Thunderbolt makes no sense as it’s the Pro market that’s going to build a market for Thunderbolt peripherals, not the consumer market (which will do just fine with USB). To be honest, the GHz numbers have been screwy for a while. You don’t know what the speed will be like until the benchmarks come in. These are new processors from Intel. My guess is that it will probe to be very fast… but the no Thunderbolt thing is just weird. It’s so weird it’s hard to complain because it’s hard to comprehend. I can’t wrap my head around it. Not only that but NO USB 3.0? 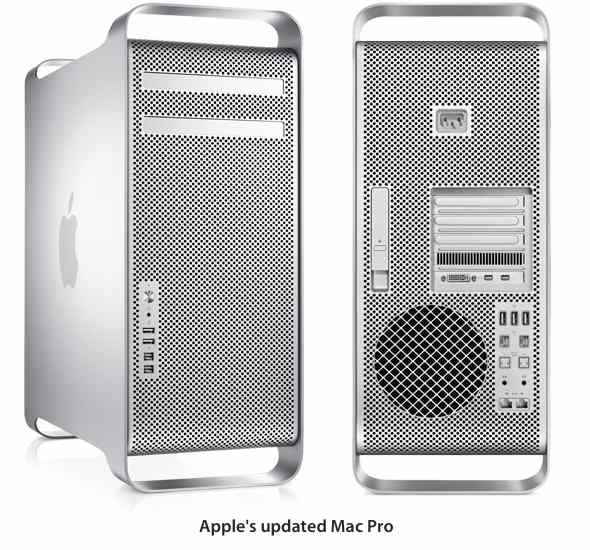 So I personally wouldn’t touch that Mac Pro until the next iteration. BUILD A NICE RENDER FARM for that money. Right. My Octo 2006 is still going to do a good render job till 2013 (2013-2014 is, anyway, the period i intend to upgrade my hard). If i’d used fiber, i wouldn’t need TB that much though. Pretty lame upgrade! The tower is a great design, hard to improve. Maybe a SATA dock in the 2nd DVD drive bay for swapping hard drives in and out. USB 3.0 and SATA III could have and should have been in the last iteration, mid 2010. Still not there after two years! Shame on you Apple. Time to put the Pro back in the Mac Pro. Please, please, include all the above in a early 2013 model. I’m certainly skipping this “update”, as I did yor last. Jeez!!! My guess is all this means is that the Ivy Bridge chips aren’t ready for desktops yet. Let the complaints about the upgrade begin! OK, pardon my earlier complaints of “not even a Speed Bump. This is a Speed Bump. Seeing as they had so many items of greater interest to the hoi polloi than this, I can understand why nothing was mentioned in the Keynote. Still … thank you Apple, for the crumbs tossed our way. This was basically just a speed bump. Given Apple’s development timeline, I can’t imagine another update for at least 6 months, and more likely 12. Still Sandy Bridge too. No Ivy Bridge processors. This is no real update. What a mess. Now we have to throw away 6 GB of useless RAM to upgrade to at least 16. In the past it was only 3. How can Apple do this? A pro machine with 6 GB of RAM is a joke. I bought 6 MacPros in April and May for my company and I upgraded them all by myself with up to 4 x 3 Terabytes and 16 or 32 GB of RAM. Much cheaper than at Apple, especially they do not offer 3 TB HDs. This MacPro update is a spit in the face of all Pro Users expecting Thundebolt, USB 3, better graphics, bigger HD, and more. These are NOT NOT NOT new models!! These are the OLD two-year old models given a (OLD) processor bump, as the 3.2 was the quad option two years ago; and the OLD style memory doubled from 3 to 6 gigs. This is the kind of update that should have been done in early 2011. NO USB 3.0, no thunderbolt, no 1600MHZ memory, and the 5770 graphics card? I think this means the MP is semi-officially being ended, but with an opportunity to get a “bargain” on two-year old tech for a few months.